To these little birds we apply all the above principles with the exception of free ranging them outside their cages. To do this would attract every predator from hawks and cats to snakes and rats and everything in between! The most popular by far is the Jumbo quail! They are used in salads, pickled, scrambled, fried for that special breakfast, or even boiled with a soft centre and served in their shells as a starter to get your guests chatting as they peel & dip them into herb salt or an exotic mayonnaise! 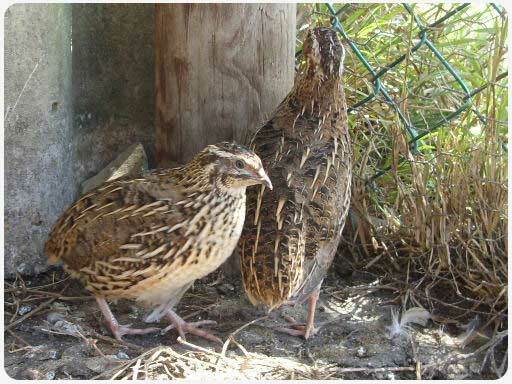 This unique quail becomes sexually mature at between 6 & 7 weeks old, but only reaches its full size around 9 weeks. The breeder gets a very fast return on his investment. From day of incubation to the laying of the first egg is a mere 8 weeks! Chickens, in comparison are around 30 weeks depending on the species. Now THAT is instant eggs ! !